In 1952 Morris introduced the Series II Minor utilising the 803cc Austin A30 engine and gearbox following the merger of Nuffield and Austin to form British Motor Company "BMC". Additional information: This picture depicts a 1954 Series II Morris Minor with the slated radiator grill, they remained in production until 1956 and the Morris Minor 1000 introduction. Siteseen Ltd. are the sole copyright holders of this Split Screen Series II Morris Minor picture, unless otherwise stated. We only authorise non-commercial picture use and particularly encourage their use for educational purposes. 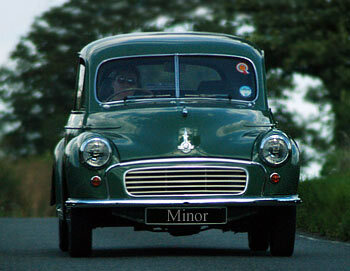 This Split Screen Series II Morris Minor picture is not in the Public Domain. 3) Use of this Split Screen Series II Morris Minor picture, or any of our pictures on websites re-distributing copyright free material is strictly prohibited.